From rock bands to DJs, the right music will make your reception sing. A reception without music is like popcorn without butter; you know you want it, and everything just goes much more smoothly when you add it. But picking entertainers can be tricky—do you want a live band or a DJ? Soulful jazz or toe-curling rock? 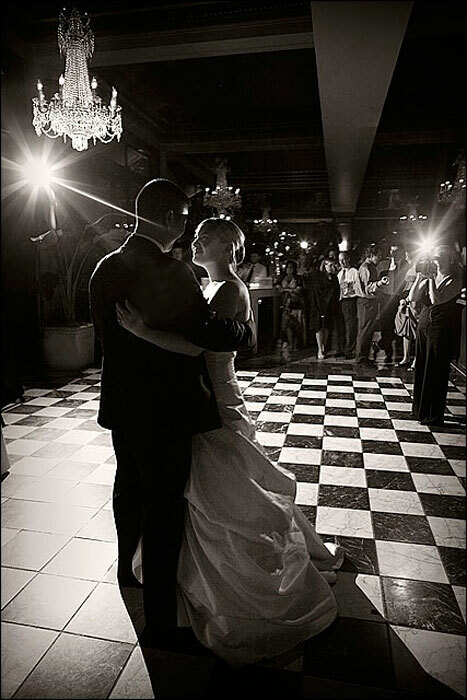 Your best bet is to envision the perfect wedding dance and look for the talent that can make it a reality. Many wedding bands are thrown together from a pool of musicians who don’t necessarily play together regularly. Still, a great band is going to have a history among its members, a sense of camaraderie and cohesion and a crackling repertoire. For a top band, couples should expect to pay between $1,500 and $4,000. Some groups can scale back from seven or nine pieces to four or five, which will lower their fees. Before deciding on a band, brides need to determine how much space it will need; whether they perform on risers or at floor level; how loud they are; what kind of breaks they take; and how long their set will last. Ask to hear the group’s demo tapes, and talk to the bandleader about the role they’ll play at your wedding: Do you want the band front and center, burning down the house, or should the music simply add ambiance to a reception fueled by cocktails and conversation? When shopping for a DJ, you should get the sense that they’re trying to understand your vision for the event. If you’ve never hired a DJ before, you may not be able to anticipate everything you’re going to need at your wedding. Going through a company can be a mixed blessing: On one hand, many companies employ part-time DJs—often college students—who can be less seasoned than professionals. But if the pro gets sick or has an accident, you’re left without music, while DJ companies will have a back-up plan in case of emergencies. The best companies also offer online planning and song selection services and boast a staff of long-term employees. Expect to pay between $600 and $1,000 for a good DJ, with about a $100 bump for ceremony coverage. The era of the turntable-toting disc jockey with 600 vinyl records crammed in the back of a pickup truck is over. Today, thousands of songs can fit in the palm of your hand and many DJs don’t actually spin records. So what do you need a DJ or band for? Wouldn’t an iPod be just as good? “If you really want to ruin your wedding, try plugging in an iPod and walking away,” Plante says. A good DJ or bandleader is part conductor and part air traffic controller, subtly managing the happy chaos of a wedding reception and leaving the couple free to enjoy their celebration. “There’s a certain kind of mixology to it,” Plante says. And even if you designate a buddy to man your iPod, you still risk becoming a slave to your own dance. MP3 players are notorious for inconsistent volume levels, and there’s no good way to fade in and out between songs, keep the energy up or cut off inconvenient intros and outros. That means if you want to hear Sir Mix-a-Lot’s famous tribute to prominent posteriors, you’re going to have to live with its 30-second groove-killing opening monologue. A DJ has to be a master mixer to keep the flow going, transitioning seamlessly between songs. Bandleaders and DJs are experienced crowd readers—they know when to kick things into high gear and when to slow it down.